Testing the Ouya USB ports. Ouya USB is great really! It gives the Ouya extra space to store games, ROMs, pictures, practicly everything that you would otherwise have problems with within the confines of estimated 3.2GB of free space that is on internal memory because the Android OS is taking up over half of the space! However, one of the annoyances that people do complain about is how long it takes to scan games. A lot of this has to do with the quality of USB thumbdrive that you are using. But could it be something more? Could it be the way that our drive is formatted that is slowing down the Ouya? What I am talking about is partitioning your USB Drive to something other then the normality in order to attain stability and speed out from your Ouys USB device. 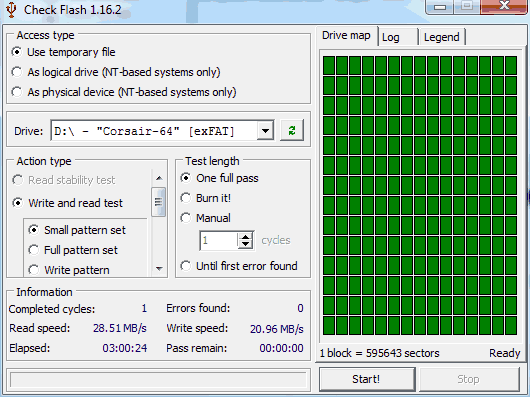 exFAT/Fat32 – This is the most common and almost defacto standard format that you will find for USB thumb-drives. Macs can read them, they work on just about any PC with a USB port. And to top it off they are a partitioning structure that can survive being ejected in mid-read/write it is almost the most sensible of all partitioning. The problem with fat32 and later fatEx partitioning is the file-size limitation of 4GB. For most people that own an Ouya this is never going to be a problem! However, for those users which use XBMC have have a high definition video that they would like to play without spending some time re-encoding the video. This limitation is a real annoyance. Fat32 used to have a maximum size of 32GB that it could format however as drives continue to get bigger a patch FATex was made to compensate for it. Note: The Ouya as of Chubracabra release is incompadible with exFAT partitions that exceed 32GB. This is most likely the case that exFAT was made during the Vista era and not every android build supports exFAT partitions. No ETA as to when a fix shall arrive for this! NTFS – Replacing FAT partitions with windows NT/2000/XP/7/8 NTFS offered better security as well as the ability to handle very large files with it. Also using a master file table, NTFS can access files much faster then FAT partitions could do. Unfortunetly if ejected at the wrong time during write it could corrupt this table and a lot of the files on a NTFS partition. NTFS partitions are typically used on very large portable harddrives for the reasons of space mentioned. ext4 – The latest in linux standard partitions. The explanation of ext4 in linux and the differences between ext2-3 would make an article in itself so it’s really better if I let wiki take that conversation! Android since it is linux native can understand ext4 partitioning. To ensure our test results will not be affected by the limitations of the hardware; I have chosen this Corsair USB thumb drive model CMFVY3S-64GG Because it’s fairly large at 64GB and I got it very cheap for around $27.00 on a special blow-out weekend on newegg. According to the company this USB stick is rated read speeds of 85MB/s and write speeds of 75MB/s. Of course those read and write speeds are based off of a USB 3.0 bus. Note: I would not suggest this stick for your Ouya! 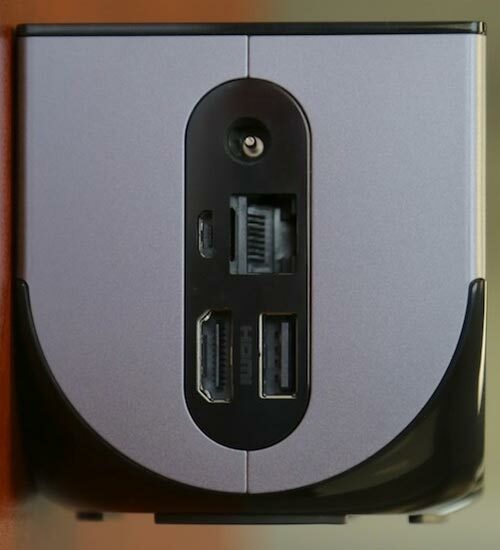 The reason why is the rubberized plastic shell presses against the HDMI of the Ouya, this could cause physical damage to the only Ouya USB port on the back. A work around of course is getting a very short USB extension cable; But the Corsair Survivor series however fits in the Ouya USB just fine. On the Ouya and other USB 2.0 bus units it will be slower due to the fact that the combined bus speed of a USB chipset is 480Mbps/s or 60MB/s in theoretical operation. I state the ‘theoretical’ side because a loss of speed can come from the USB bus chipset itself, the NAND flash on the USB chip or other external issues such as the usage of USB hubs inside of cheaper hardware such as laptops and desktops. I shall also be using a Corsair Survivor 32GB USB 3.0 stick model CMFSS3-32GB in this test as well. Even though not nearly as fast as the Voyager at 60MB/s read and 50MB/s write. It’s still more then enough! Either way your Ouya will Never be able to achieve the full bus speed that this stick has to offer. The utility that I use when testing memory that I am not sure if is totally legit (i.e. Chinese ram) or if I just want to benchmark a USB stick to see its true speed is a program called Check Flash.There is absolutely no documentation as to the developer or website that I could refer to. However I was pointed to this software as the leading verification tool whenever you are purchasing memory from Ebay vendors and is used to verify the overall integrity of the drive that you received. Even if you received it brand new this program is a good idea to verify that the product you received is %100 perfect. Click here for a direct download of Check Flash version 1.16.2. This program is incredibly dangerous to a person who does not know what disk testing software does. By its very nature it writes and reads to every section of the drive resulting in destruction of any data that is on the drive. Also, because of the nature of flash memory where there is so many writes that are allow before it has the potential to corrupt itself, putting this program in long-test mode or to repeat the tests over and over again is a very bad idea as it could destroy the USB stick itself. This website takes no responsibility to personal, physical or cognitive damage this program may cause to you. As always programs that you download off of the internet may have a virus that not even the author is aware of. Always have a virus checker installed when downloading programs like this off of the internet. I will be using my Samsung N150 laptop with windows 7 loaded onto it. This laptop only has a USB 2.0 bus and I beleive all ports are shared via internal hub. So it should give us a rough idea as to how this USB 3.0 Corsair stick performs in a USB 2.0 environment. Picture above shows that write spped is 20.96MB/s and Read at 28.51MB/s . I expected it to do a little better with writing, but on the Ouya it’s the read speed which is more important. 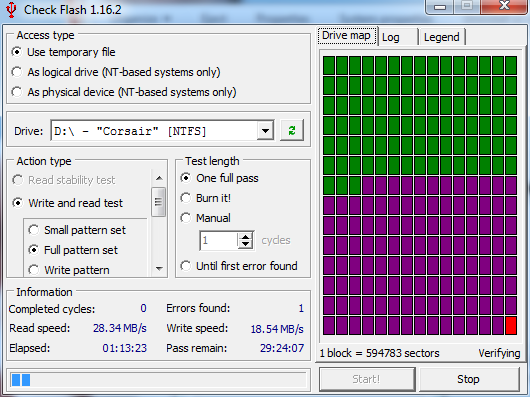 I ran multiple USB sticks through this same process but apparently there’s a bug in check flash where it always marks the last sector of the drive as BAD if the drive is formatted in NTFS. This is actually good to show you as an example as what happens when Check Flash finds a problem with your drive. Since my drive formats just fine with exFAT I shall consider this a bug in the software and to test only in exFAT on the windows side. The program that I like to use for testing the speed on android devices is one of the more popular ones on Google Play called A1 SD Bench. The reason why I like this program is you can define custom locations so in the case of the Ouya it likes to mount the USB drive into a directory you can simply specify the folder and run the tests on it. To setup the /mnt/usbdrive folder simply arrow down to Settings. Check the box to Add custom location and then specify the location as /mnt/usbdrive which is the default where Ouya mounts the device to. All of this can be done from the ouya joystick there is no need to bring out a keyboard during any of this operation. Final Results of Ouya USB drives. The readings were interesting because I expected the EXT4 partition to do much better. I feel it may have actually been hindered by the fact that it accesses once every few seconds all of the time possibly checking INode data but I am not too sure. Either way the FAT32 is what won out on the tests between both of my USB Sticks. It sticks. I personally use EXT4 and will continue to do so because of it’s stability and ability to handle large files. Another thing I found interesting is the Internal Memory of the Ouya and how it rated. Where it gave an excellent rating of 34-35MB/s it’s ability to write data is abysmal to say the very least. Once again, writting data to the Ouya is nowhere near as important as reading as beyond installing apps and saving profiles, writing is at a minimum on the Ouya. No, it does not. Since a lot of the apps for android are relatively small due to phone restrictions. Load-time is hardly noticeable. However, when doing file operations on the Ouya it becomes noticeable especially when transferring music and pictures over to it. Speed may be an important factor when playing movies from a harddrive or USB stick to your Ouya so it might be a important factor to consider when buying a stick. Mounting more then one Ouya USB storage device. As of this time in the documentation the Ouya can only auto-mount one device at a time. plugging in additional storage technically should be possible via shell in ADB but it does not mount such things automaticly. Ouya Support – Other troubleshooting issues.